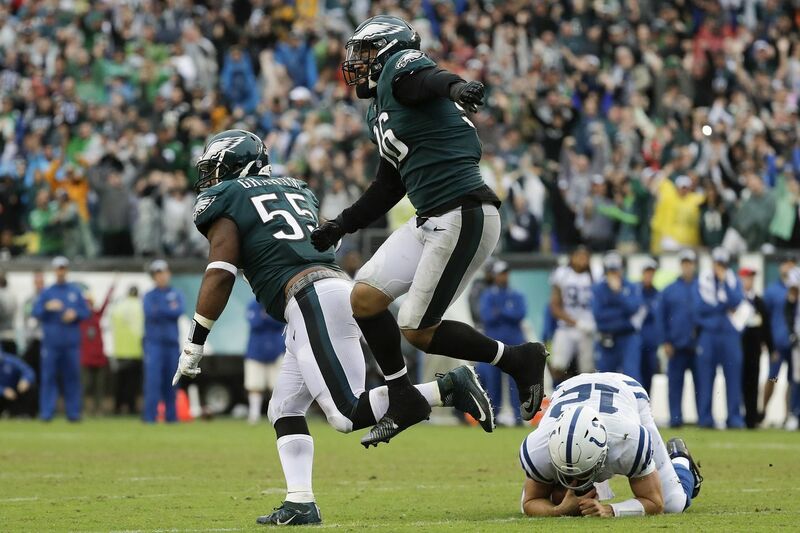 Derek Barnett and defensive end Brandon Graham celebrate their late fourth-quarter fourth-down takedown of Andrew Luck. Derek Barnett is 22. He is just 22. There were three players, just three, on the Eagles' 53-man roster Sunday who are younger than he is: Josh Adams, Jordan Mailata, and Josh Sweat. Of the five players the Eagles selected in this year's NFL draft, just two are younger than Barnett. It feels as if he should be older. He joined the Eagles in April 2017, when they picked him in that draft's first round, yet it feels as if he's been here longer. Maybe it's because you keep hearing his name in those moments that matter most. In last season's NFC Championship Game, it was Barnett who sacked Case Keenum on a key third down in the second quarter, forcing a fumble and a turnover that stopped the Minnesota Vikings from scoring a game-tying touchdown. In Super Bowl LII, it was Barnett who, after Brandon Graham knocked the football from Tom Brady's hands late in the fourth quarter, saw the ball bounce off the U.S. Bank Stadium turf and grabbed it like a prize. And on Sunday, it was Barnett who came off the right edge and curled toward Andrew Luck like a Formula 1 car on a hairpin turn, sacking Luck on fourth down from the Eagles' 4-yard line with 79 seconds left in regulation to preserve a 20-16 victory over the Indianapolis Colts. "This kid keeps getting better and better," Eagles coach Doug Pederson said. "He's an unselfish ballplayer. He'll play special teams if you ask him. He'll rush the passer if you ask him. … It just seems like somewhere in the game, [No.] 96 is going to show up and make a play." It's well and good that Barnett would cover kicks and field punts if Pederson suggested it. But the Eagles drafted him to chase down quarterbacks. Over three seasons at Tennessee, Barnett had set the Volunteers' career record for sacks, with 33. After the Eagles picked him, their player-personnel people and coaches spoke ad infinitum about Barnett's "bend," his ability to lower his center of gravity and remain upright and in motion, as if speed-skating, to get past an offensive tackle. That decisive sequence Sunday was a case study in why they raved as they did. With the Colts' double-teaming defensive tackle Fletcher Cox, Barnett was lined up one-on-one against Le'Raven Clark, who was playing left tackle but isn't really a left tackle. Before this season, he had played right tackle and right guard. But the Colts' regular left tackle, Anthony Castonzo, missed Sunday's game with a hamstring injury. So there was Clark, isolated against Barnett, who needed just two steps to blow past him, hit Luck in the left hip, and send him staggering and stumbling to the ground. "On that play, he did nothing special," Cox said. "He just did his job. He beat a guy around the edge." It can be easy to say a player should just do his job. But on a play that big, in a moment that could change a game's outcome, it would seem more challenging for any player, especially one as young as Barnett, to stay disciplined, to avoid trying to do too much. "Nope," Cox said. "That's what we talk about. Do. Your. Job. That's the thing with our d-line: Do your job. Don't try to do anyone else's job, because a play will come to you, and, obviously, a play came to him. He bent the corner, and he made the play to seal the game." Barnett had five sacks last season, and the 1½ sacks he had Sunday were his first this season. He has not been a dominant pass-rusher in the NFL yet, but he hasn't needed to be. He has been part of the Eagles' rotation of defensive ends – Graham, Chris Long, now Michael Bennett – from the instant he arrived, a solid pro already who has room develop further as he gains experience. "People are, like, 'He's got to take this step or that step, or he's doing something way different than he did last year,'" Long said. "He's made little improvements in his game, little nuances that are going to continue not only to sustain his growth but add little wrinkles that make him a little bit better. I'm always wary of saying, 'Yeah, he's improved a whole bunch.' He has improved, but he was disruptive and a big part of this defense last year, as well." Yes, he was. He made important plays when the Eagles most needed them then, and he made the Eagles' most important play Sunday. Fourth down, ball in Luck's hands, the Colts four yards from the go-ahead touchdown, and Derek Barnett and the Eagles did their jobs, nothing more or less. "We stayed calm and executed when we needed to," he said. Their oldest young player, most of all.